With an empty bar In 5 minutes find your 1 rep max of front squats. Take a 5 min break. With an empty bar, in 5 minutes find your 1 rep max of Dead lift. 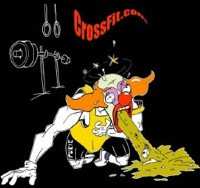 Go to our twitter: bu_crossfit to follow and get latest pics and info. Plan on joining us at 10am on Sat. for a New Years eve WOD and lunch at DJ's.